I learned a LOT from 2017’s Cyber Weekend sale at The Kwaj Shop. Most importantly, fulfillment and shipping periods. This is why I’m offering a GREEN Weekend Sale and not Black Friday or Cyber Monday sales this time around. Although Kwajalein on-islanders did not report receiving their packages late on Kwaj, the timelines were scarily tight. So, instead of having The Big Sale starting the Friday after Thanksgiving Thursday, I am doing it a week early. Yes, really! 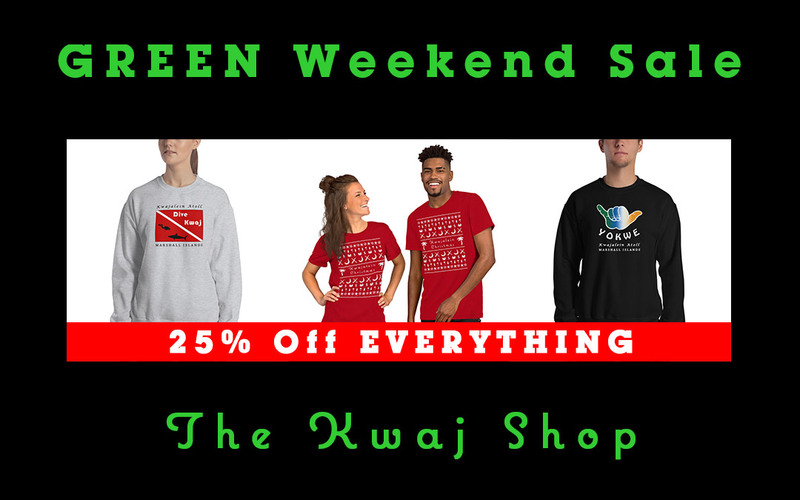 You can get 25% off every item in The Kwaj Shop. Just use COUPON CODE: GW252018 at checkout. The coupon is good from 16 November 2018 12:01 am to 19 November 2018 11:59 pm US Central Time. It cannot be used with any other coupons or items marked as “on sale”. You can use the coupon as many times as you want during the sale period. Sweatshirts are now available for the first time ever and everybody seems to be really excited! At the time of this post, there is one design on a zip-up hoodie and several designs on regular style sweatshirts. All sweatshirts are unisex and can be found in the Men’s Shirts and Women’s Shirts categories on The Kwaj Shop. This year the marks the introduction of Kwaj Net designed Christmas apparel. These products will be COLLECTIBLES!!! A new Christmas designs will be created for every new Christmas season. The previous years’ designs will be discontinued on December 31st of those same years. Designs are currently available on t-shirts and sweatshirts. All Christmas designed apparel is unisex and can be found in the Men’s Shirts and Women’s Shirts categories on The Kwaj Shop.